next issue of the magazine out soon! Many of my clients know me as the "mineral makeup" artist, and for good reason. I've been sticking to my guns with stocking my kit with professional-grade mineral makeups. I admit I flirt with Makeup For Ever's HD line, and MAC shadows, but I am still about healthy makeup and healthy skin! 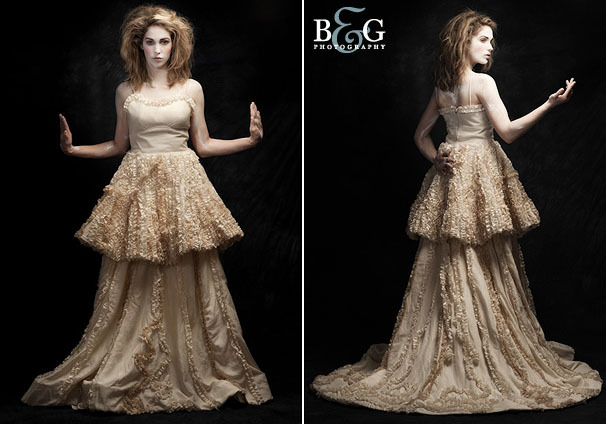 Designer Lindee Daniel creates eco dresses with the same order of consciousness. Her belief in artfully and meticulously crafted clothing sets her apart most gown designers in Los Angeles, or the country. Lindee also has an unwavering commitment to all things natural, while also giving back to the community 5% of sales to help youth in the skid row area of Los Angeles. Earlier this year I met Lindee through my friends Jen and Nate Berggren, of B&G Photography. Our goal was to create a wedding couture photoshoot, one that would give some edge to the normal, Anthropology wedding look we've been used to. I created this look based on the kabuki, Elizabethan, and Victorian styles. I used white clown makeup on the model's face, neck, arms and chest. Rosy cheeks, lips are a burnt rust color, and the eyes are a smokey, deep emerald green. I also emphasized the brows by making them darker and thicker with an auburn pencil and brown powder. I put the model's hair in a very high ponytail, gelled around it to make it very smooth, and used a curling iron, pins and hairspray to create the bun. 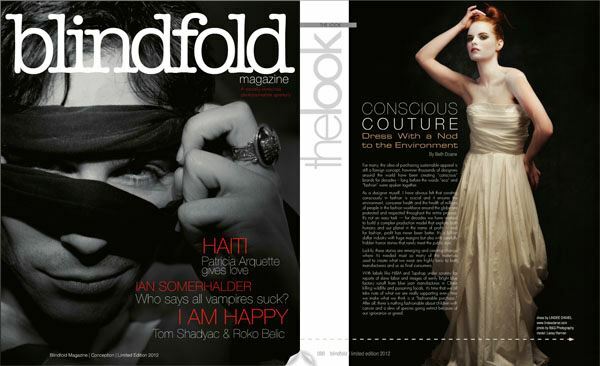 Blindfold Magazine is a socially conscious magazine about people and companies doing things outside of the box with an emphasis on giving back. LIKE us on Facebook & FRIEND Mariah!